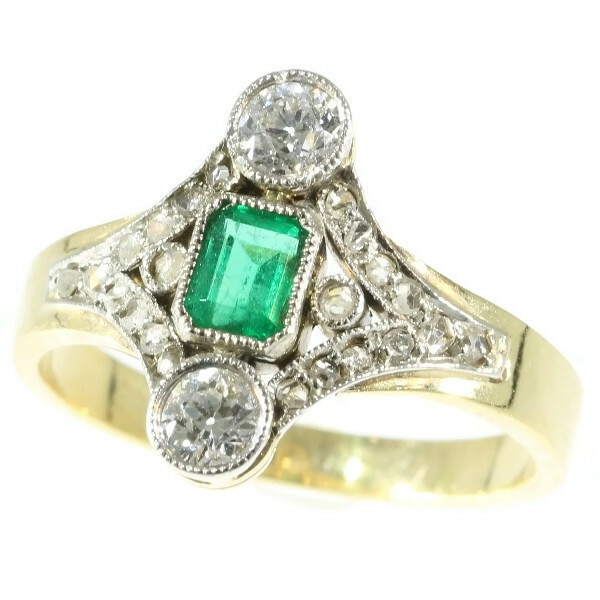 Late Victorian diamond and emerald engagement ring: Description by Adin Antique Jewelry. Through the rectangular cut verdant emerald in a vertical sequence between two old European cut diamonds, this 14K yellow gold Late-Victorian ring from 1900 shows the star alignment of any union meant to be. A row of rose cut diamonds sprouts from on each side of those two diamonds to meet in the shoulder and so create an overall openwork lozenge shape. With another two rose cut diamonds alongside the emerald and with all the settings in mille grain white precious metal, this jewel guarantees an everlasting purveying of brilliance. Material: Two tones of precious metal, the main part being 14K yellow gold and the white parts are either white gold or platinum. Diamonds: Two old European cut diamonds with a total estimated weight of approx. 0.30 crt. and 22 rose cut diamonds . We do not have the weight of the diamonds which is normal in our trade when it comes to rose cuts. Birthstones: Diamond is the birthstone (or month stone) for April. and emerald for May.